New Mercedes E-Class Estate unveiled | What Car? This is the all-new Mercedes-Benz E-Class Estate. On sale in early 2010, it will follow launches of the new E-Class saloon and coupe models earlier this year. 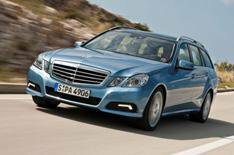 As with the previous four generations of Mercedes E-Class Estate, this version puts practicality at the forefront. The styling is a straightforward adaption of the saloon, with a longer, upright rear end that gives a huge luggage space. With the rear seats folded, the E-Class Estate has a load capacity of 1950 litres, which is bigger than its key rivals': the BMW 5 Series Touring gives 1650 litres, while the Audi A6 Avant has 1660 litres. Safety innovations include Mercedes' 'Attention Assist' system that sounds an alert if it detects the driver is getting drowsy, while its 'Pre-Safe' system primes the seatbelts and airbags if it senses a crash is unavoidable. The E-Class Estate will come with self-levelling rear suspension as standard, which means that heavy loads shouldn't affect how the car handles. Mercedes says the Estate's suspension has been adapted from the saloon's, with stiffer shock absorber settings that make it just as agile. Performance AMG versions will follow. Three trims SE, Avantgarde and Sport will be available. Prices have yet to be confirmed, but we expect a premium of around 1800 over the saloon, which means a starting point of around 29,000.